Last year I switched from a Lowepro Voyager C strap to a BlackRapid RS-Sport. I like this combo a lot, especially if I’m only carrying my Camera and not much else. However I recently Purchased a Crumpler Messenger Boy Stripes 8000 as my new smaller camera bag to take with me on my trips. I had my RS-Sport hooked to a Manfrotto RC2-Plate using there conversion kit (FastenR-T1) this works well when carrying just the camera. However when using the Messenger Boy it became a hassle to always unhook my camera from the RS-Sport and store it. Storing it with the RS-Sport attached required just about as much effort. I like the RS-Sport and wanted to continue using it, so I was looking around for a solution. I saw an advertisement in one of my photography magazines about the Camdaptor straps and adaptors kits for tripods. That would allow me to quickly store and take out the camera, have a good grip on it! 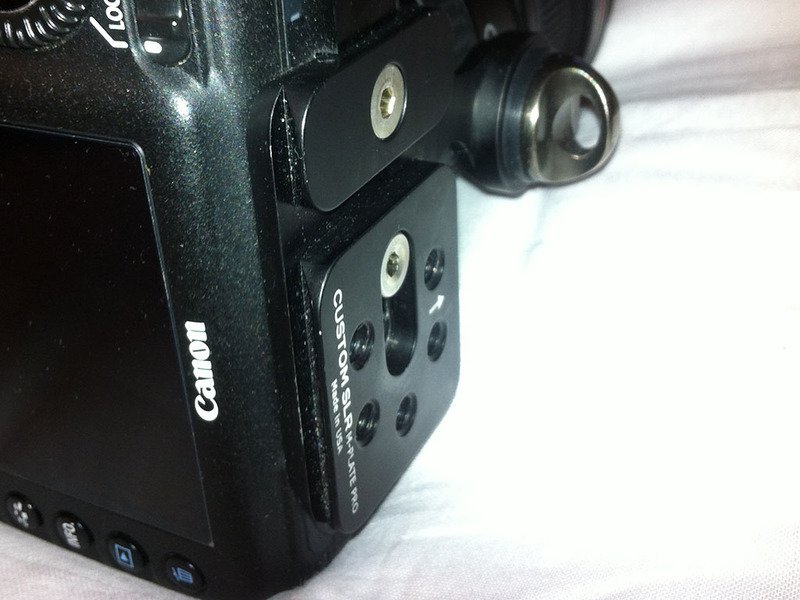 Unfortunately a converted Manfrotto RC2-Plate for my BlackRapid strap occupied the tripod mounting hole. I e-mailed Jim (from Camdaptor) to see if it was possible to combine the too, he got back to me quickly and said it was not possible. After some googling, I came upon the CustomSLR M-Plate Pro, which was a kickstarted project that had just gotten all the needed funding. It worked with the Manfrotto RC2 and ArcticSwiss tripod mounts. It also came with a mounting hole for there own sling straps similar to the BlackRapid ones. After making sure the diameter of the screws were the same I placed my order for the M-Plate Pro with the strap loop. I looked at the straps offered by CustomSLR but although they looked decent, they didn’t look and seem nearly as good as the Camdaptor ones. In the end I decided to order one from Camdaptor without their mounting kit and use it with the M-Plate Pro. This was partially thanks to the great review it got and the honestly and quick response of Jim. And boy, the strap was worth it! I’ve used this combo on my trip to Norway, it worked even better than I had hoped. I kept the converter RC2 Plate in my bag as backup (A good thing too, see a bit further in this review). 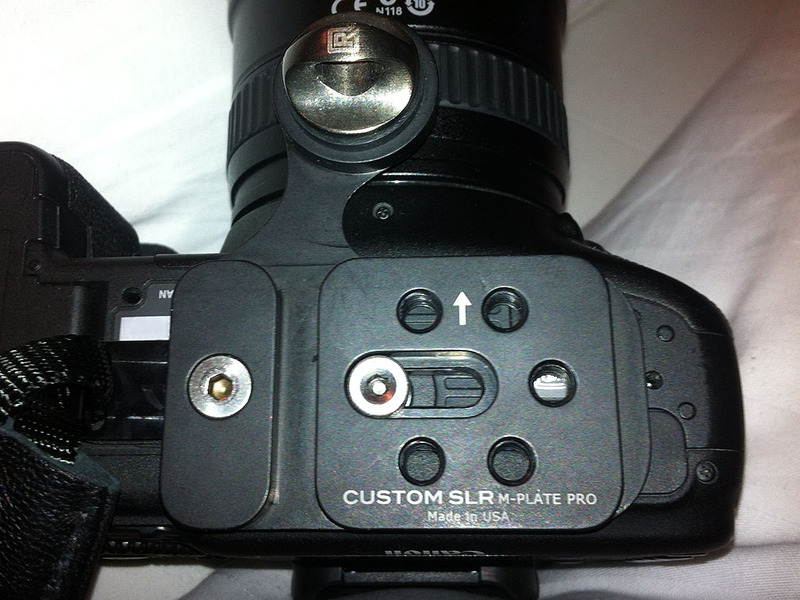 The original mounting screw for the BlackRapid strap fits perfectly on the M-Plate Pro. I’m confident the screw + M-Plate Pro can carry the weight of my camera + lens. The quality of the M-Plate is simply amazing. It fits snugly with my camera body. Both the battery and memory doors are still accessible. The part that makes contact with the camera body is also made of crock which is very nice. I also tested the plate with my monopod before leaving on my trip, it worked fine! So overall I am very happy with this combination and I enjoyed the flexibility it gives me. Unfortunately as I found out in Norway my tripod head is on the list of unsupported Manfrotto heads, granted It was the one that came in the kit. It was a decent one but not the one I originally wanted. But it worked fine for me so I could not justify the 150 EUR+ price tag for the head I originally wanted. Although I will be replacing mine before my next trip. I temporarily solved it by hooking one of my converted RC2 plate to the mounting points on the M-Plate Pro, this works fine but it was very bulky and made it hard to store it in this setup. I’m also not a fan of stacking mounting plates. To summarize I highly recommend the CustomSLR M-Plate Pro, it works perfectly in combination with my BlackRapid kit and with the Campdaptor strap!